Snowboarding is a tough winter sport that requires skill and balance. Snowboarding involves having your feet attached to a snowboard and going down a slope. It is a fast paced sport that can be quite enjoyable for anyone who loves the winter. Getting started with this sport is not difficult. Follow some of these steps to get yourself prepared for your first time out on that snow. The snowboard itself is the deciding factor in whether your snowboarding experience will be bad or good. One of the best boards to buy is the All Mountain board for any beginner. Alpine and Freeride boards are great, but they are best for advanced riders. An All Mountain board will allow you to maneuver through all kinds of mountain slopes as a beginner. There is no need to buy a freestyle board if you’re just getting started. When browsing through an online store, look for All Mountain boards. The boots you wear are another important aspect of the experience because they can be hard on the feet if you get the wrong kind. They need to fit well but not be too tight on the feet. Buying boots before the board is a good idea, as this way you can find a boot that fits into the board. It’s definitely difficult to buy these two pieces of equipment, but it’s not too hard if you know what to look for. When traveling to a far off snowboarding area that requires you to fly there, you can have your snowboarding equipment shipped to your residence, and then use specialized companies to ship it to your destination. Carrying snowboarding luggage can be a hassle, so this site can make it a bit easier on you. Your equipment can be transported safely over to your main destination without you needing to drag it around. There are certain clothes you must wear if you want to succeed on the slopes. Getting frostbite and being frozen is not a good feeling, especially since you’ll be out there for quite awhile. First, you must wear a helmet to protect your head. Falling down is common, and hitting your head is also possible if you aren’t prepared for the fall. Goggles are a great addition for keeping the snow and wind out of your face and protecting your eyes from the sun, whilst gloves to protect the hands are crucial. Wearing clothing in layers should be the goal. Wearing thermal clothing under your pants and your jacket can help keep you warm. And, wearing sweatpants under your waterproofs is a smart idea. When it gets too cold, it can be hard on the body if you aren’t bundled up. When snowboarding, it is tough to stay upright if you aren’t that experienced. 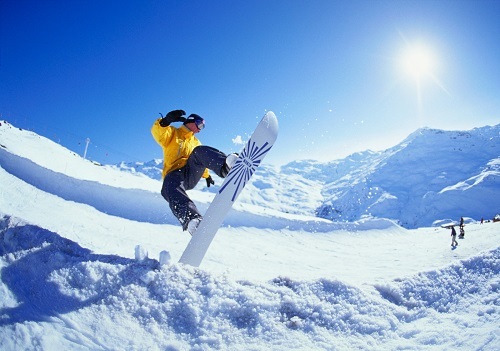 Snowboarding requires massive balance and a strong body to withstand the winds you will face when heading down slopes. The key is to take lessons with your friends and family. This will help you to learn at a pace that suits you, whilst also remaining fun. It’s easy to feel like you are being left behind when you are in a group and don’t know anyone. The key to learning fast is to stay on the “bunny slope”. This small slope is where the beginners go, and it will give you the chance to get a feel for the snow without having to attempt the big hills with experienced snowboarders. Another vital tip is to bend your knees and use your arms to balance. Don’t be afraid to use your arms to help you stay upright. The bending of the knees helps create momentum as you go from left to right. Snowboarding is a sport that isn’t exactly easy to pick up, but as you continue, it does get much easier. Make sure to buy good boots from a reliable brand and a board that will be good for a beginner. Use the tips above to create a better snowboarding experience, and be sure to be prepared for the cold weather. Finally, have fun! This entry was posted in Snowboarding, Winter Sports and tagged Beginners, Snowboarding, Winter Sports. Bookmark the permalink.